4-Word Review: Watch out for Cajuns. A National Guard unit goes on a training exercise in the Louisiana swamps and finds themselves fighting for their lives from a group of vindictive Cajuns that lurk in the woods. Just about all the characters are obnoxious, unlikable, and incredibly ignorant. These guys have to be the most undisciplined and poorly managed guard unit out there. It becomes like a comedy of errors and one almost begins to side with the Cajuns. The suspense ebbs and flows poorly and most of the time there is no tension at all. The final sequence takes too long to play out until you end up not caring what happens. It would have been better had the Cajuns not been so hidden and given a face and some distinction. It also would have been a better atmosphere had the story taken place in the summer instead of the winter. The film though is really hurt by the fact that it is too reminiscent of Deliverance which is a better film simply for the fact that it created a more lasting eeriness. Also, the sequence involving the killing and gutting of what looks to be a wild hog is just about as gruesome and graphic as the infamous turtle killing scene in Cannibal Holocaust. On the positive side there is one good scene involving a very intense attack by a group of vicious dogs as well as a nicely photographed knife fight between actors Powers Booth and Fred Ward. 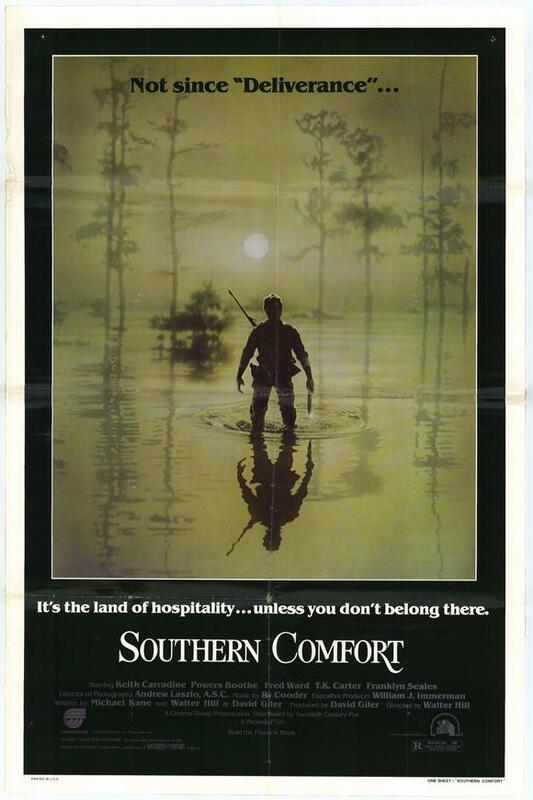 The Cajuns are portrayed as being more cunning and clever than in Deliverance, which makes this a little more of a slick thriller. Ward is very good in his role as one of the surly soldiers and Keith Carradine is surprisingly engaging in his part. Ultimately this is a grade C Deliverance that despite some good attempts just never comes together. It would be best to just watch the original and avoid this one completely.